This case example highlights what ambitious adult/youth collaboration can look like in practice, highlighting FUTUREWORLDS, a large-scale, annual community event co-produced by AS220 youth and staff. This case example relates to the broader resource on Structuring adult/youth collaboration in ambitious digital learning and making projects, highlighting what such collaboration can look like in practice. Read more about AS220’s FUTUREWORLDS pedagogy in their article about the project. 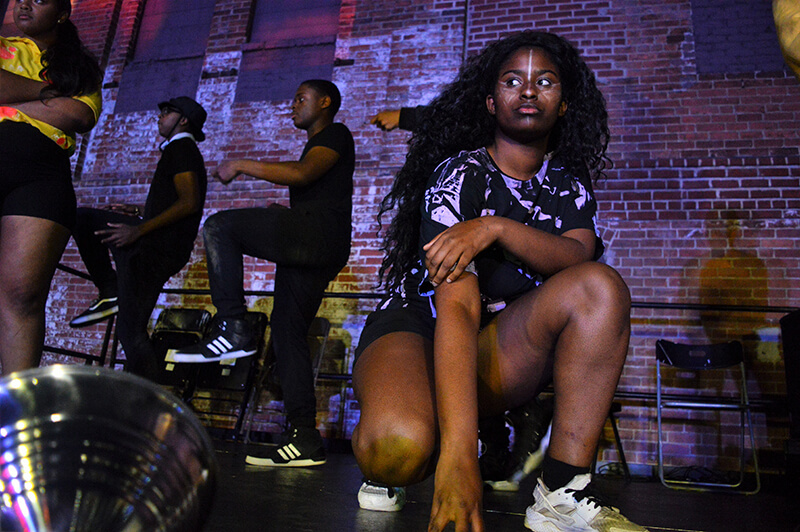 FUTUREWORLDS is annual event held by the Providence-based youth arts organization AS220 Youth. The event is rooted in themes of Afrofuturism, which melds narratives from black and sometimes Latino culture with the SciFi genre, using science fiction as a speculative medium about different possible futures for marginalized communities. Afrofuturism focuses on ‘writing the future’, in contrast to storytelling genres in African American and Latino communities that focus on the past. In order to put on the event, ‘apprentices’ from each of the active ‘studios’ at AS220 Youth and across their three sites in the city work together to determine both a theme and format for the event, and then coordinate and collaborate in order to make the event happen. Youth first spend time researching the themes in depth before any art is created to gain a better understanding of the systemic barriers that they face on a day to day basis. The approach is highly collaborative. I like to have staff and young people be involved in every phase of creating the project. I think sometimes to a fault because that can also drag a process out significantly. The script writing took a crazy amount of time because literally, young people and staff from across our three sites writing this play together. And it was beautiful. It was amazing, it was beautiful, and it was highly professional. But to get it to that point, it took months. It took months just to get everyone to feel like they had at least a piece of that script was theirs, or they could see their line in it they wrote, their idea come to life. It took forever. And then, really, it did take me and Janay, staying up until 4 a.m. consecutive weeks out of the summer, editing it, just making sure it was polished enough to be presented.